DARK HORSE: Poems. C&R Press, 2018. Available here. I try to ache more beautifully asserts Kristina Marie Darling and her literary creation Jane Dark as they lead us into a melancholic marital darkness, where hatchets sing against the butcher’s block and declaratives of I hope she chokes and I hope you drown hex us. One of the many knockouts of Dark Horse is an eleven-poem suite titled “Sad Films” in which Darling strikingly constructs a cinematic, expressionistic terrain—a chiaroscuro composed of language—where a dove refuses the dark nest of a mouth, a bride’s dress darkens, and vowels are trapped in the luminous arc of a throat. Her study of grief and violence is underscored by her many “frames” connoting entrapment, blackout pages that read as redactions, and motifs of erasure and asphyxiation; yet, the centering force of Dark Horse is a refusal to be silenced, because even the buttons down the back of my neck were a declaration. This is a book that deserves to be heard as it pulses with complexity, innovation and intelligence. Meet Jane Dark—both the everywoman and the uberwoman—who tries “to ache more beautifully” as she suffers the indignities of a husband’s infidelity and the “other wife.” In a series of stunning prose poems entitled “Sad Film,” Kristina Marie Darling sublimely describes the strains of a relationship without “even a cough to break the silence.” This inventive writer re-imagines the cultural scripts of heartache and the relationship imperative white honoring the pain and chaos of betrayal as well as the violence for which we are capable. DARK HORSE is a masterful pastiche, repeating phraseology transforming and deepening its meaning from poem to poem. 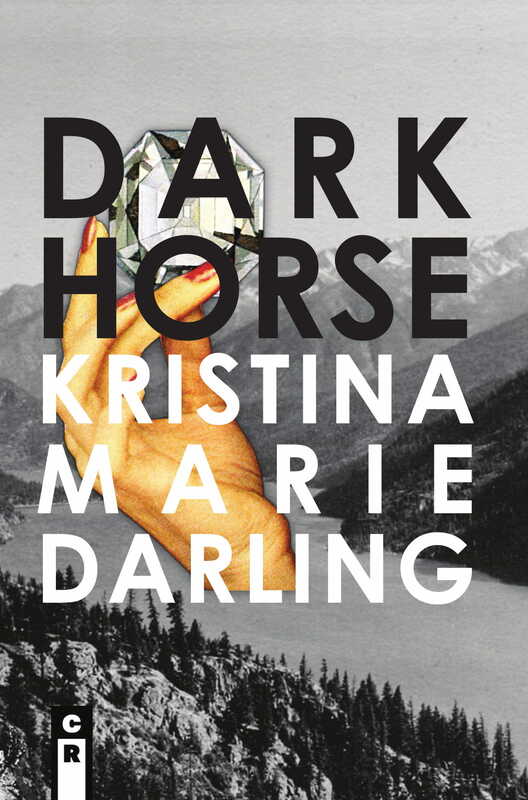 Book-ended in blacked-out pages, Kristina Marie Darling’s Dark Horse draws its reader into a fractured historical mystery of longing, unbelonging, adultery, and unadulterated rage. “You know how it is between women,” confides the narrator of this altogether unsettling collection, “first honey, then smoke.” Like every good novel of detection, the pleasures of this work lie in what is withheld from view. “There are some things,” writes the poet, “that you don’t need to see.” Nonetheless we find ourselves implicated in this literary inquest, even as its primary suspect refuses the twin consolations of closure and disclosure: “Because even the quiet girls have teeth.” Darling’s latest collection is one of those uncanny books that asks to be read in the dark. In Kristina Marie Darling’s Dark Horse, Jane Dark steadies the camera on the constantly shifting landscapes of a marriage. Each poem is a brick in a love’s architecture, a film cell spliced and edited to show the husband and jury the flowerbed, the knife, the epithalamion with snow falling into a white boat bearing another woman to shore. The book becomes an epistolary film and trial, revising what was said and what was meant in the story that was always one match away from ending. What I mean to say is, I want to push my thumbs between Jane Dark’s lips to feel the teeth she’s hiding, and you will, too. If John Clare’s hallucinatory madness (especially the part where he imagined with great shame that he was secretly married to two women at once) collided with Lyn Hejinian’s My Life, David Lynch’s Mulholland Drive, and the novels of David Markson, the result might very well be Kristina Marie Darling’s Dark Horse: Poems (which by my lights is a sort of novella in verse(s) and a supermassive black hole). In this cinematic, swirling and ferocious, parenthetical fracture of a book, a mysterious dark heart (in the persona of Jane Dark) is burning down the house with the “other wife” inside it. These all-consuming (and wildly compelling) poems are nerve-y with gravity and an almost Romantic dark energy, which feels secretive, contemporary and visionary all at once. “Surreal and elegant, Darling’s exploration of indelible romantic loss is open-hearted and empowering.”—Publishers Weekly (starred review).